April 2012, Tiburon, CA: Captain Maggie and The Angel Island Tiburon Ferry Company receive the 2012 American Red Cross Life Saving Organization Award for 2 life saving water rescues in the same year. On behalf of the Angel Island Tiburon Ferry staff, it was truly an honor to receive the Life Saving Organization Award at the 2012 American Red Cross Heroes Breakfast. We also feel privileged to stand along side the outstanding community members and award heroes present at the ceremony, and are grateful for the opportunity to be a part of such an uplifting and motivating event. As California’s only remaining family owned and operated ferry boat company, we are happy to be a part of the Marin community, and the greater San Francisco Bay Area. We take our job to serve and protect you on the water very seriously. Of course, we are a recreational outlet and we are also here to make sure you enjoy yourselves on our boats…and have fun in this beautiful place on earth…we call paradise. 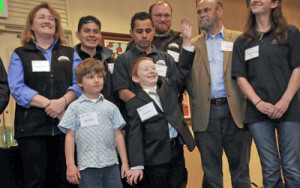 Angel Island Tiburon Ferry’s youngest “crew member” and hero to be acknowledged by the American Red Cross is Ben Bryerton, age 6, who, during one of the water rescues was responsible for manning the boat’s communication system to alert the crew when the Coast Guard was on the line while the rescue was taking place. Our maritime motto is “be prepared for anything.” The public acknowledgement of our lifesaving rescues provides a great opportunity to reinforce just how important it is to “be prepared.” Whether your out on the water, on Angel Island, driving to work, or at home, having emergency supplies and a family plan in place BEFORE a situation occurs – will give you the peace of mind and tools needed to handle whatever curve-balls life throws your way. It has been our family’s pleasure to serve you on San Francisco Bay for well over 100 years, and we look forward to many more years of safe & happy sailing ahead. Join us for a spectacular Sunset Cruise Season Kickoff Friday, May 4, 2012 – 6:30 p.m. – 8:30 p.m.
One free child (under the age of 3) is allowed per paying adult. Please call (415) 435-2131 or email us for further information or to make reservations. 2012 Red Cross Hero Awards, American Red Cross Heores Breakfast, Angel Island Ferry, Angel Island Tiburon Ferry, be prepared Marin, Maggie McDonogh, Marin Heroes, Special Events, survival guide, water safety.